Heineken Star Serve programme is the Heineken Pouring Ritual. 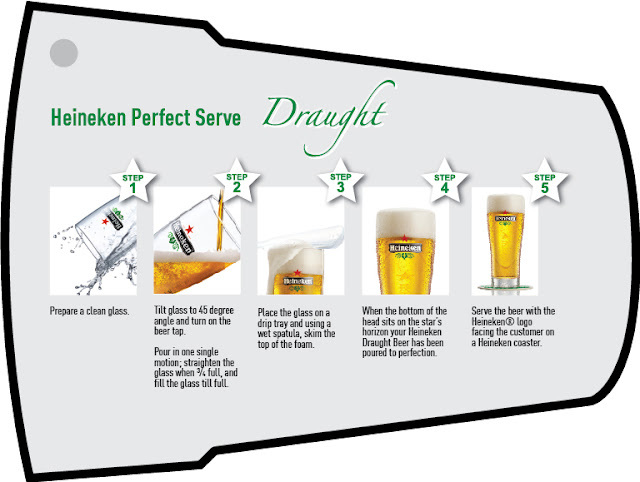 Five steps are all it takes to deliver the perfectly served Heineken draught beer for the quality Heineken drinking experience. “We want our discerning drinkers to understand the process of serving the perfect pint of Heineken and at the same time demand for it. We hope the Heineken Star Serve programme not only uplifts the drinking experience in Malaysia but also enhances the hospitality industry in the country,” explains Ms. Jessie Chuah, Marketing Manager of Heineken Malaysia. The Top 8 virtual pourers in the app will receive an exclusive invite to a physical pour-off in the National Finals of the Heineken Star Serve competition, with the winner of the pour-off taking home an all-expense paid trip to join the winning bartender in Amsterdam and witness the Heineken Global Bartender Finals in November. The Heineken ‘Star Serve’ contest runs from 19 August – 20 September 2013. Simply head to Heineken’s Facebook page (www.facebook.com/Heineken) today and perfect your pour to earn your passport to the home of Heineken.